When Arctic Thunder came out a couple of months back, critics slammed it for being a fast game with little depth, where the chaotic racing through barely visible and blurry levels hampered the overall fun factor of the game. EA Sports now comes along with a game that looks and plays suspiciously similar to Arctic Thunder, but with the EA Big brand of game play attached to it, and a much sharper and more dynamic look, they’ve done what others said couldn’t be done – they made freestyle trick-oriented snowmobiling fun to play and a joy to watch. 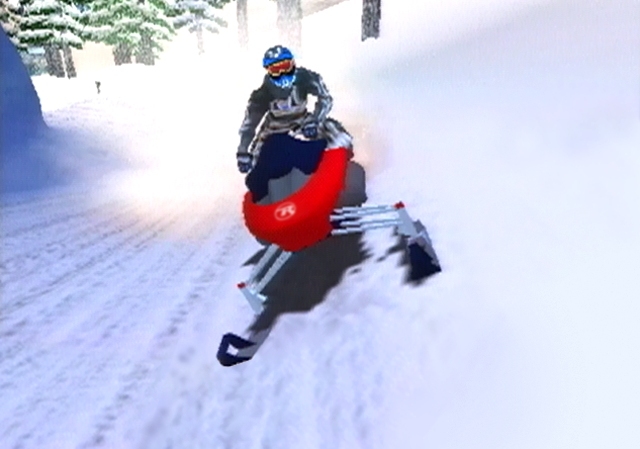 The graphics in Sled Storm are the best we’ve seen for a winter racing game. Each level is cleverly designed, with hidden shortcuts and treacherous terrain, like ice floes, dead trees, drops, and chasms. They are all beautifully illustrated, with fog effects in the misty depths, sun glare on the exposed slopes, and shifting illumination in the vast ice caves. The riders themselves are also detailed, with a host of smooth moves and tricks that are thrilling to watch, and the lighting effects are a joy to behold. In extremely busy levels, like the circus level, the level of detail and vivid colors never eases, although you may see a little slowdown now and then. The sound is generic, with hard-driving manic metal floating through the races, and forgettable bands like Overseer and Hein Hoven filling out the soundtrack. Fortunately, the game’s frantic pace leaves little room to appreciate the audio – but if you find yourself listening, you’ll also hear an inordinate amount of audio for a game like this (there was barely any in Arctic Thunder, save for the manic announcer). There’s lots of chatter on the slopes, and most of it is the trash-talking from your race mates. The other in-game effects are subtle, but appreciable – the steady whine of your engine, the coughing when your snowmobile won’t start after a crash, and even the absence of sound when you catch a cliff and sail into the air. The terrain is actually the dominant factor in the game – learning how to master the terrain will definitely give you the advantage in close races. When coming down from steep jumps, you have to land on the softest part of the next area – powder, if it’s available — and you have to know when to ease into a turn and when to take it full bore. 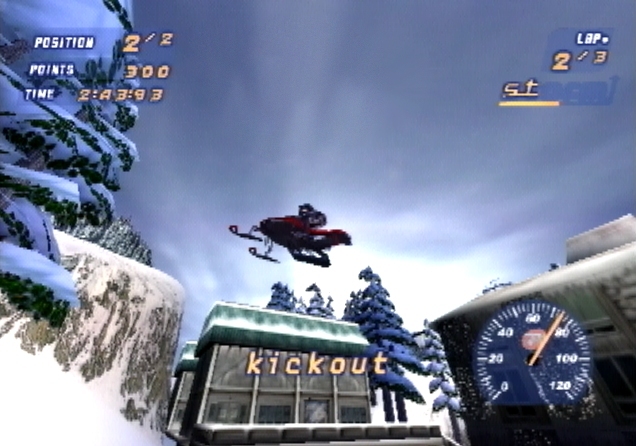 The tricks assigned to each player are spectacular, but one-dimensional – you usually have about four or five to choose from, and although not as cool as the Uber Tricks in SSX Tricky, they still find a way to fascinate you. Unfortunately, you have to give them plenty of breathing room, or more often than not you’ll find yourself come crashing down. So, what separates this game from Arctic Thunder? Not much really, but what does make it different is what makes most EA games different. There’s a certain indefinable nuance — call it a level of commitment, if you like – that makes the game feel more professionally done. EA took a the sport of snowmobiling and gave it the Tricky makeover, delivering deeper detail, more depth to the levels, and greater care in the level design. They ended up with a cool racer that may not appeal to a wide variety of gamers, but will certainly entertain some. If you’re looking for a snowmobile racer that sports some cool tricks and some close races, then Sled Storm could be the perfect storm for you.